Why Is There A Need For Marketing? Anto Budiardjo - Clasma Inc. In our third pull out supplement on convergence prepared as a joint venture with Engineered Systems called Marketing Convergence, AutomatedBuilding.com contributing editors Anto Budiardjo, Jack Mc Gowan and I outline the importance of our industry getting involved now. In the past we did not realize that our industry's direction and our personal lives would be so effected by information convergence. We cannot wait until convergence occurs and then get involved with how it gets marketed, because it will be too late; the marketing plan will not include our industry. Our industry's presence in creating a marketing convergence plan changes everything. We as an industry bring new concepts and tools to the convergence table in the form of "real time information." Our industry's business is collecting, acting on, and distributing real time data such as temperature, pressures, energy usage, client comfort, humidity, IAQ, video, security card ID's. As an industry we are just starting to grasp the concept of how this real time data converges with our clients' information enterprise. Our clients are also just starting to discover how information that is presented easily (and anywhere) can be extremely useful for enterprise growth and for staying competitive. 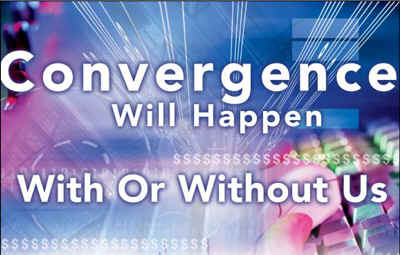 How can our industry help market convergence? Marketing is the discipline that starts by understanding the needs of the market and then embarking upon campaign(s) to persuade the target audience of their need of the product (convergence in this case). The objective of marketing is to have the audience wanting the thing we're selling. If the marketing is done well, then the sales task should be much easier. The information industry has recognized, even more than our industry, the value of our commodity of real-time data. At the same time, we are discovering that convergence is running rampant: automated buildings are becoming smart; smart buildings are becoming intelligent; intelligent buildings are becoming more intelligence; and building intelligence is overflowing into community intelligence. I am not sure that any of us fully understands our present convergence capabilities. Jack, Anto and I have collectively prepared this third supplement to present a call to action to the industry to get more involved in marketing our convergence. In his section of the supplement, the creator and marketer of BuilConn, Anto Budiardjo, will explain the need for marketing, with topics such as the basics of marketing and why there is a need for it, providing a clearer view of our evolving industry. Jack McGowan, contributing editor for AutomatedBuildings.com and writer for Engineered Systems and Energy User News, shares his thoughts and actual experiences selling convergence. His section redefines the automation industry based upon the changes that are occurring in technology and the market place. More importantly he analyzes "why buyers buy" and "how sellers sell" automation. In my August column for ES, I stated, "We cannot expect our traditional markets to lead to our future business model; we must morph our identity and methodology to capture the new opportunities of today's Metamorphic Markets." The article quoted a report from Frost & Sullivan's North American Integrated Facilities Management Services Markets (http://www.BuildingTechnologies.frost.com), and stated that revenues in this industry totalled $12.39 billion in 2002 and were projected to reach $21.89 billion by 2009. "Corporate America is rethinking its approach to facilities infrastructure, with an increasing number of companies concluding that outsourcing makes sense as a way to cut costs and focus on revenue-generating core competencies," said Sanjiv Bhaskar, Frost & Sullivan Industry Manager. I also made this observation; Billions of dollars await this industry, and although a portion of this work is traditional building automation work, you may never get to show your wares if you have not morphed to be the new service provider your client is looking for. If it is not possible for you to develop this kind of depth on your own, are you a value-added member of a winning team that has these capabilities? Reformatting our companies to play in this rapid developing new metamorphic marketing arena is mandatory to our survival. In another column I stated, "One of the major changes is that we are no longer a specialized industry that is applied as a preconceived part of a building. We are now the innovators that extend the reach and interaction of our client's information enterprise." The way we market our large Building Automation Industry is rapidly changing. As if this technology explosion was not enough, now, all the marketing rules of the past are changing. Old relationships, methodologies and even some of the mythologies are giving way to new and creative approaches to marketing our wares. Once we understand our mutual capabilities, we must roll this into a financially justifiable package that will provide "off balance sheet financing" to reduce or eliminate our client's real costs. Do not interpret that creative financing means reducing our market share, quite the opposite. Getting involved in our client's financial plan will allow us to innovate and help put the cost, savings, and paybacks where they should be. In my October column "Going Global" I said that all this talk of convergence suggests a coming together, but to achieve the reality of global convergence we must pursue a mind-expanding transition. Personally, it has been very much a mind-expanding experience since the start of AutomatedBuildings.com four years ago and three years of writing articles, columns, and supplements for Engineered Systems. The nature of today's Web-based information anywhere world has created the phenomena of global convergence in building automation or building intelligence. In the past, language barriers, system types and general concept variances separated the world's building systems. Web-based presentations are changing all that. The de facto standard of the information technology (IT) world, Wintel (Windows plus Intel), when combined with a Web browser, has created a global presentation template. My conclusion from that column is that we are all going global in a mind-expanding journey that will result in the cross-pollination of building intelligence for the world. We have the opportunity to build on and improve each other's ideas while creating global guidelines. Our product development is now global and not restricted to geographical areas. All of the above ideas and many more in our industry require marketing and a maturity to allow our industry to sell our products and services. 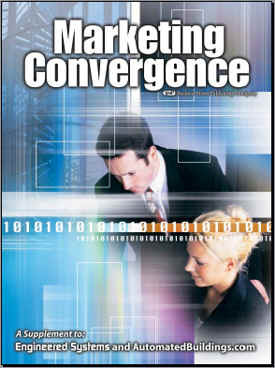 I have extracted some examples of steps toward marketing convergence from some related articles on our online web site. The article, "Managing Your Building as an Enterprise" by Brian Jones, a marketing consultant with The S4 Group, Inc provides an overview of the issues. Imagine a new generation of building automation systems that will increase profits and pay for themselves. Now, imagine leveraging your existing systems and infrastructure and accomplishing the same thing. Integrating non-IT systems (such as security, building automation systems, factory automation, process control, etc.) with back-office business systems and enterprise management frameworks within an enterprise, improves the overall efficiency of the organization by making near real time information available for use in the decision making process. This provides a significant advantage to companies who are striving to stay competitive. Another article "The Time and Resource Generator" by Paul F. O'Conor, chief marketing officer, WebGen Systems, presents the concept of learning and markets several new concepts. He states that the black hole of building management and control can be cost effectively transformed into a time and resource generator. The result is a fully automated environment that delivers a more consistent level of comfort, a reduction in energy consumption of 10% to 25% and, because the computers and controls are off site, easy connectivity and no additional burden on the IT group. This real-time system still allows control to be maintained locally, when desired; but also allows management to "aggregate" data over large portfolios of buildings regardless of which types of BMS are in place. The WebGen System "learns" the effectiveness of each device and how they work together. Creating a simple graphic to demonstrate marketing concepts can greatly assist. This next example was extracted from the article ""IT" Could be the Start of Something Big" by Tom Hartman, an AutomatedBuildings.com contributing editor. All great marketing plans are based on the simple presentation of complex concepts. We all need to work to achieve better and simple presentation models that depict our message to the world. We all have much work to do to grasp what marketing convergence might mean, but I am sure that with constant communication as an industry fed on good examples, we can send a unified message to our clients and the world about the value the intelligent automated building industry brings to the convergence table.